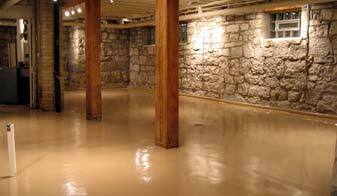 Designer polymer and epoxy coatings are an excellent choice for basement flooring. Our unique systems allow you to enhance the concrete rather than cover it up. For the price of quality carpet we can create a custom look with our diverse color and texture options. CGFC coating systems are more practical than traditional options such as carpet, tile, linoleum, and wood. We install a moisture tolerant basecoat designed for basement applications which allows us to warrant our product from delamination. The seamless nature of our product provides for easy cleanup if water problems occur. Simple and more affordable options are available for utility, laundry, and storage areas. Our floors promote an organized environment that is easy to clean and maintain.